Care and attention to detail has made Uncle Mike's Beef Jerky and Beef Sticks the Number One Choice for meat snacks in the region. Offered in six delicious flavors, this beef jerky is moist and firm, not leathery like other jerky found in stores of national chains. 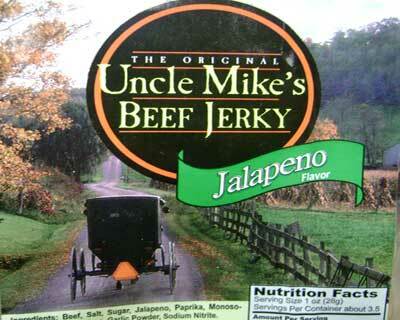 Once you try Uncle Mike's Habanero Beef Jerky, we know that you will agree. Whether you're hiking, camping, boating, or fishing, Uncle Mike's Beef Jerky provides you with the protein boost your body needs. We use quality meats that are delivered fresh to you. Order now! BBQ, Spicy Hot, or Original flavors. *Percent daily values are base on a 2,000 calorie diet. Your daily values may be higher or lower depending on your calorie needs.